"Advance Wars: Days of Ruin (titled Advance Wars: Dark Conflict in Europe and Australia, and Famicom Wars DS 2 in Japan) is a turn-based tactics video game for the Nintendo DS handheld game console. It is the fourth installment in the Advance Wars series. 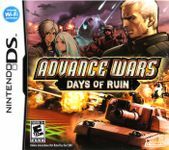 Advance Wars: Days of Ruin was intended to have a darker atmosphere and more serious tone in contrast to the previous installments in the series, and features a new storyline independent of the previous games. Set amidst a post-apocalyptic world, the story focuses on the Rubinelle 12th Battalion, one of the surviving remnants of the military of the country of Rubinelle, which had been locked in a century-long war with its rival, Lazuria, prior to a devastating global meteor shower. In the aftermath, the Battalion devotes itself to saving any other survivors of the disaster, despite the shattered nations renewing their war against each other and an uncurable disease ravaging both sides. Meanwhile, a mysterious faction with unknown motives takes advantage of the destruction and pushes both sides deeper into conflict from behind the scenes." Source: Wikipedia, "Advance_Wars:_Days_of_Ruin," available under the CC-BY-SA License.